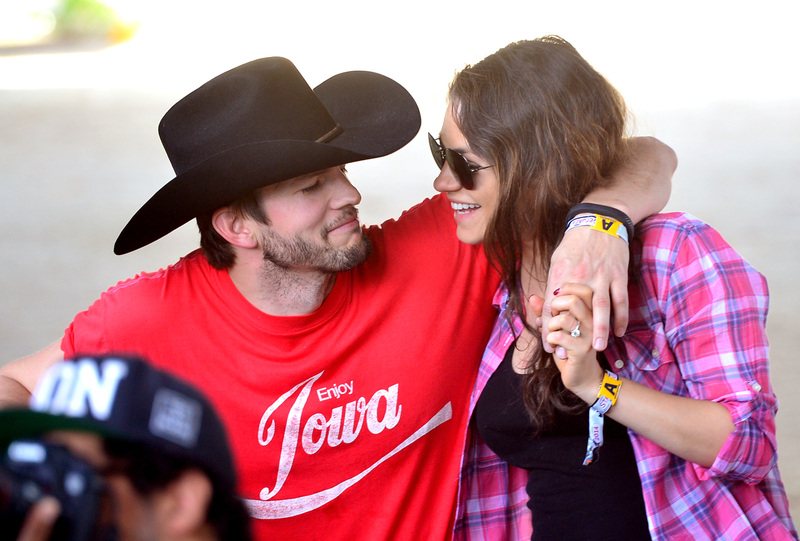 Ashton Kutcher and Mila Kunis are just a pair of hopeless romantics, and it’s no secret that their years of fake TV dating has everything to do with their current relationship status. As you know, Mila Kunis and Ashton Kutcher met on the set of That 70s Show as on-screen couple Jackie and Kelso. Now, they've become the loviest, doviest couple in Hollywood. During the show, the two allegedly didn't work well together and most of their co-stars were surprised to hear of their engagement. Funny how life imitates art sometimes, right? Perhaps the two just needed time to realize just how right Kelso and Jackie truly are for each other. Now the pair is blissfully in love, with a baby on the way and wedding bells on the horizon, and they definitely don’t shy away from revealing their hopeless love and mutual devotion. Sappiness is certainly a welcome guest in the Kunis-Kutcher household. It would appear that the one thing they enjoy more than PDA is talking about just how in love they are. In honor of the amazingness that is Kelso and Jackie back together, I’ve collected a list of the sappiest things Ashton Kutcher and Mila Kunis have ever said about each other and being in love. "I was like, 'Oh, he's so cute, it's the Calvin Klein model!' Then I was like, 'I have to kiss him?' I was so nervous and uncomfortable. I had the biggest crush on him." In a 2001 interview, Kunis explained that Kutcher was her first kiss while filming That 70s Show all the way back in 1998. A story for the grandkids, right? "I'm the first guy she kissed? Oh my god, I had no idea! I'm so glad I didn't know that or it would've been too much pressure." Kutcher revealed his side of the kiss story in an interview with People in 2001. "We all have movie star crushes... I'm marrying mine." We love you Mila, but vom. "I never wanted to get married. From the age of 12, I prepared my parents for no marriage. Then things changed — I found the love of my life." Kunis explained her marriage views to W Magazine in her interview in their August issue. She's totally going to become one of those aunts who asks if you're dating anyone, and when you answer "no", she'll be like "It'll happen! Love always does." You're free to roll your eyes. "I can tell you, love is great, love is wonderful and it's all around us [winks]... See? I just gave you an awesome quote!" Kunis teased Io Donna with this sound byte when asked about her relationship with Ashton Kutcher. Can't you imagine her being picked up by bluebirds and swept away after saying this? "Vulnerability is the essence of romance. It's the art of being uncalculated, the willingness to look foolish, the courage to say, 'This is me, and I'm interested in you enough to show you my flaws with the hope that you may embrace me for all that I am but, more important, all that I am not." Wow. That's a lot of sap. Ashton Kutcher: semipro dancer and scholar of love.